We regularly look at the data we have on developer jobs in South Africa. Previously, we’ve analysed salary-related data in different ways by looking at the discrepancies between Johannesburg and Cape Town, different programming languages and educational backgrounds. 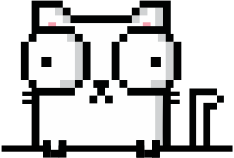 This time, we decided to analyse the time it takes a developer to find the job they want. 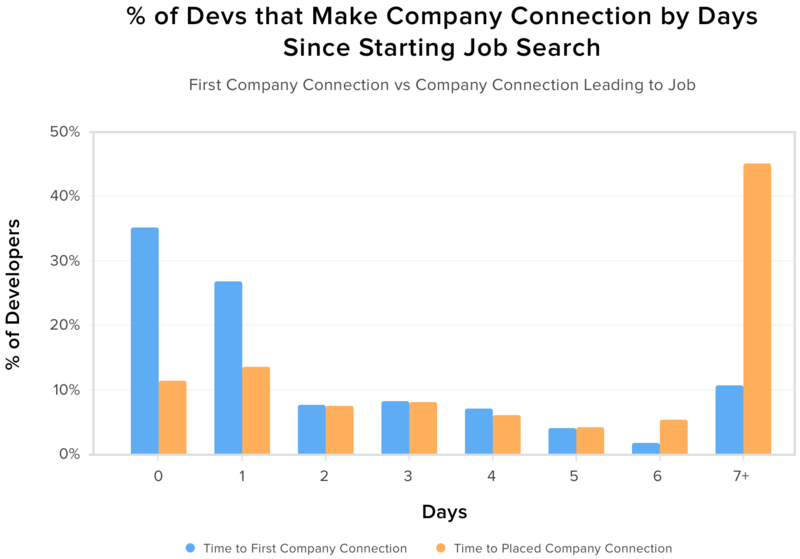 To help developers and companies understand the local job market, we compared the time related to different aspects of a developer’s job search on OfferZen. How long does it take to connect with promising companies? 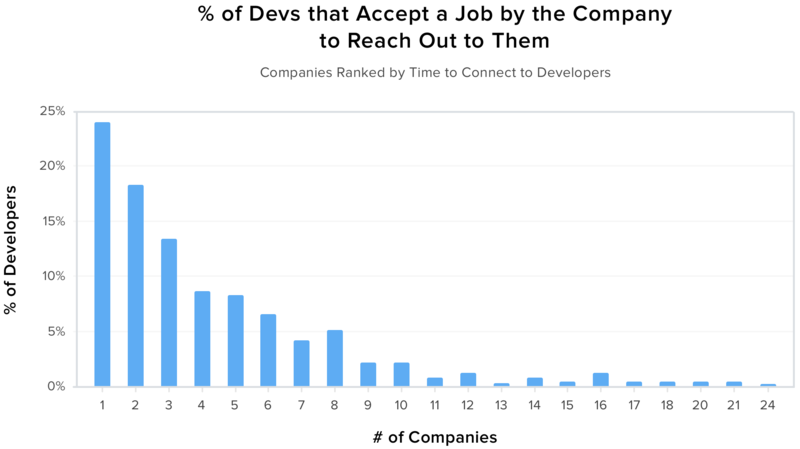 In order to find a new job, developers first need to connect with companies who are hiring. That’s why we looked at the time it takes developers on OfferZen to receive their first interview request. More than 60% of developers are contacted by a company within one day of being live on OfferZen. Given the ever-increasing demand for developers, this is not a surprise. Companies are hungry for great talent and generally log onto OfferZen at least once a day to check out new candidates. That also explains the drop in the number of interview requests after the first day - as shown by the graph above. However, to find a job they really want, devs need to connect with the right kind of company. That’s why we also looked at this question: How many companies contact a specific developer before he/she accepts a job offer? The following graph shows that distribution. Although most developers accept a job from the first company that reached out to them, others take a lot longer to take their pick: Some developers only accept a job from the 24th company that approaches them on our platform! We also looked at the overall time it takes a developer to meet the company they end up joining once they’re live on OfferZen. 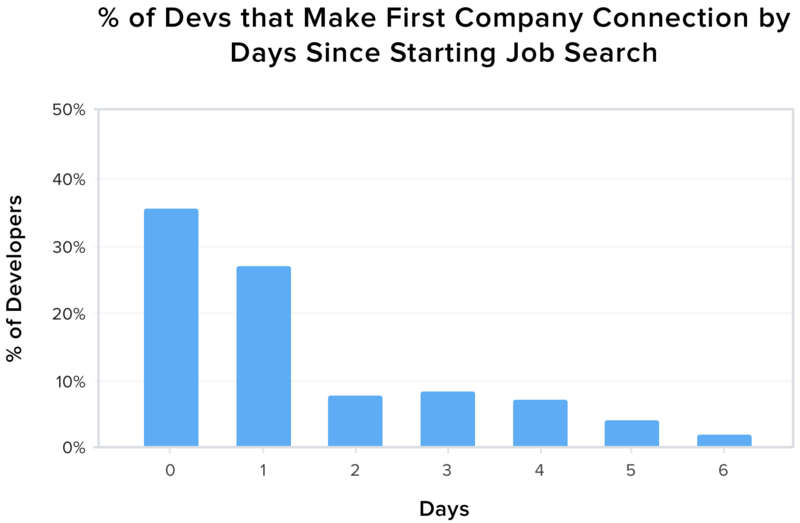 More than 40% of developers join a company that takes more than six days to connect with them. This adds more nuance to the insight mentioned earlier that more than 60% of developers are contacted by a company within one day of being live on OfferZen. We think that it confirms the fact that developers have the power in the job market. They will wait for the best opportunity and a company they really like. It might also show that the opportunities available to developers are not homogeneous and that choosing carefully matters. For developers: On average, it takes four companies for a developer to find one they really like. Developers have a lot of options and therefore they often meet with multiple companies to ensure they find the right fit. For hiring managers: Speed is key and companies act fast. If you’re a hiring manager seeing a candidate you’re serious about, you should try to be the first to contact them. How long does it take to actually find a job? There are a lot of steps between meeting the right company for the first time and finally accepting a job offer. 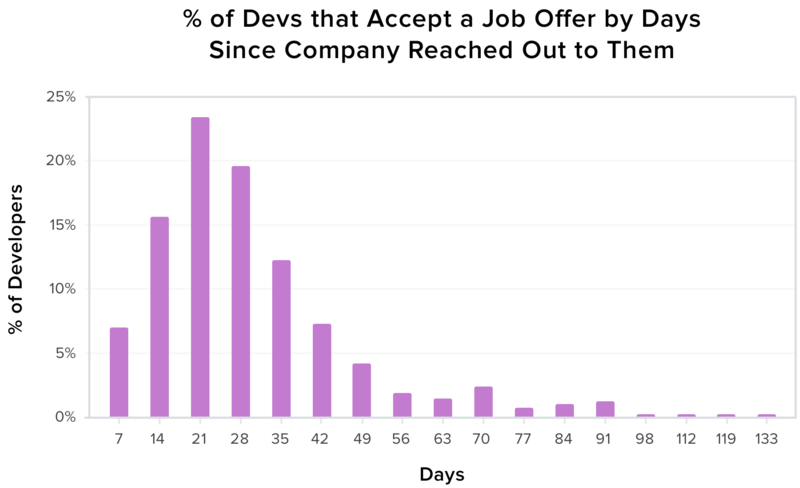 66% of devs on OfferZen accept a job offer within one month of being matched with the respective company. That is quite interesting: Despite the fact that developers and companies on OfferZen connect very fast (even within the dev’s first day on the platform), the interviewing process tends to take quite a long time. Developers generally go through a few rounds of interviewing before the companies extend an offer. The number of individual interviews combined with the intricacies of companies’ internal processes really slow down the overall process. In order to understand how long all this takes, we looked at the entire period between a developer going live on OfferZen and accepting an offer. 50% of developers accept an offer in the first month of being on the platform. Not surprisingly, the overall distribution of time in this graph looks very similar to that in the previous one. This confirms that the processes following the “successful introduction” (namely interviews and other administration) are the longest part of a developer’s job search. 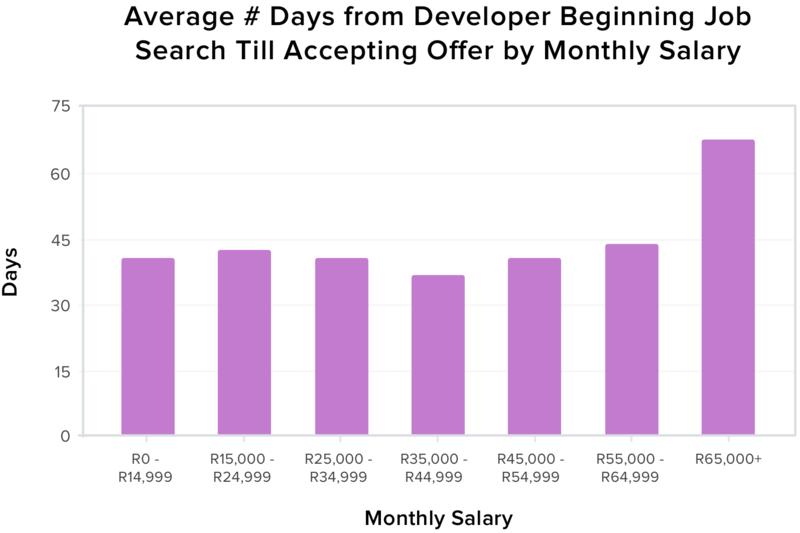 Developers who earn more than R65 000 per month can, on average, take 70 days to get an offer! The employment landscape is remarkably diverse because devs are not bound to one specific industry. When looking for a new job, devs have many different roles and working conditions to choose from. In addition, demand majorly outstripps supply - there are plenty of interesting companies in South Africa, but a relatively small talent pool of top developers. Developers come in many different shapes and sizes. Their types and levels of skills vary a lot from developer to developer and companies need to do thorough screening to make sure they find the right candidate. On average, this takes about one month. 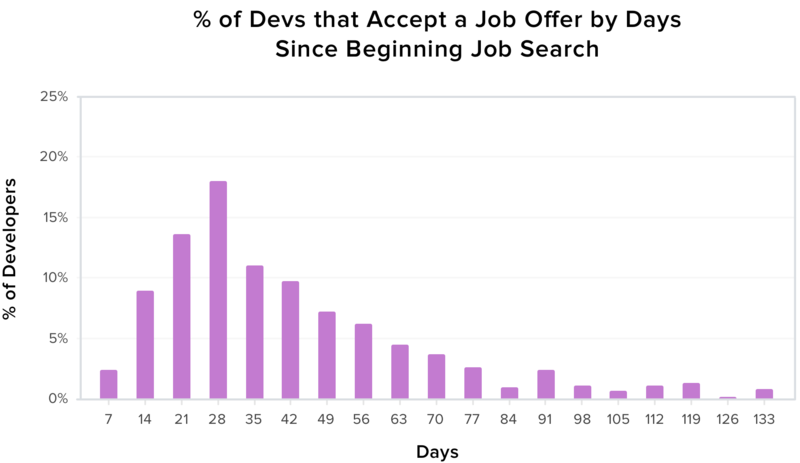 On average, it takes a dev one month to find a new job. Senior developers have it rough, as their job search can take almost twice as long. Developers have a lot of options and the luxury to take their time in choosing their next career step. Companies will have a 25% chance of getting the candidate they want if they are the first company to reach out to them.